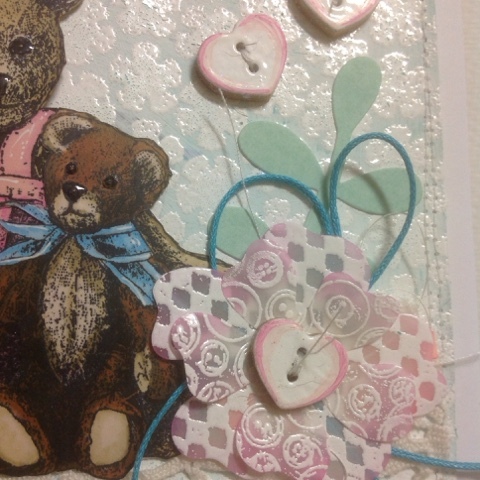 The Crafty Individuals challenge is asking for lace, buttons, bits and bobs. Really something to make me step out of my comfort zone! I've had this cute teddy stamp for a while, and now I decided to try it out. Also posting for the SimonSaysStamp Monday challenge (stencil it) and the WOW embossing powders challenge (Anything goes). I stamped the teddies several times on a marker pad and proceeded to practise colouring with Promarkers. Four images, and I cut them up and pieced together the best parts so I got the image you can see on the card. The eyes and nose were finished with some Glossy Accents. Fabulous card Kristiina. Lovely embellishments. The accents on the nose and eyes really bring the teddies to life. Such a great a idea. Thank you for playing along with the Crafty Individuals Challenge. Thank you Kriistina for this delightful card for the CI challenge. 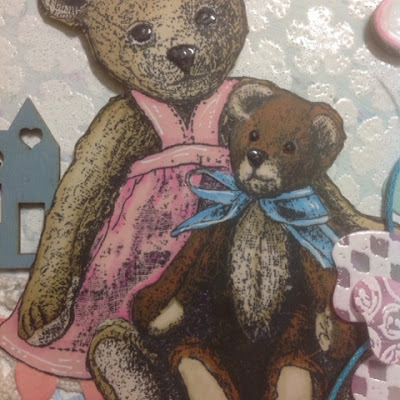 Such a pretty card and I adore the way you stamped and layered the teddies, brings wonderful definition to the card and the addition of the Glossy Accents is fabulous. Thank you for entering the Crafty Individuals challenge. 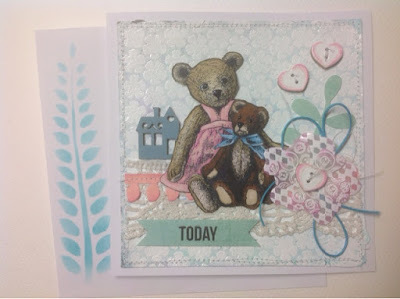 Beautiful card and adorable teddies!